If you followed me on Twitter, you would’ve seen me gush about the Ogre story scene shared by Subaru and Ram in Re:Zero. To me, that’s a 10/10 scene in a 7/10 show, purely because of its visual presentation, rich dabbles of mythos and a curiously abundant atmosphere. 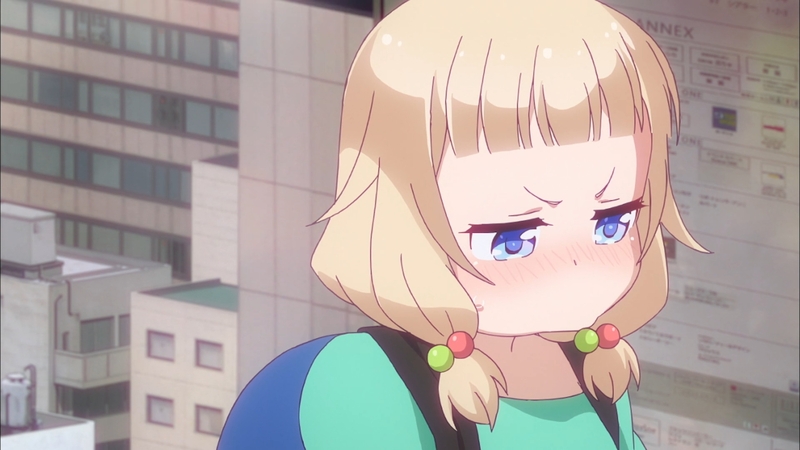 New Game hit its stride was a few standout moments of absolute moe-ness and charm, especially when it comes to scenes involving my girl Nenechi. Basic rule for me enjoying the show: when she pouts or cries on screen, it’s a 10/10 moment (Nenechi literally embodies my primal need to protect adorable things). Go ahead, try to resist her. 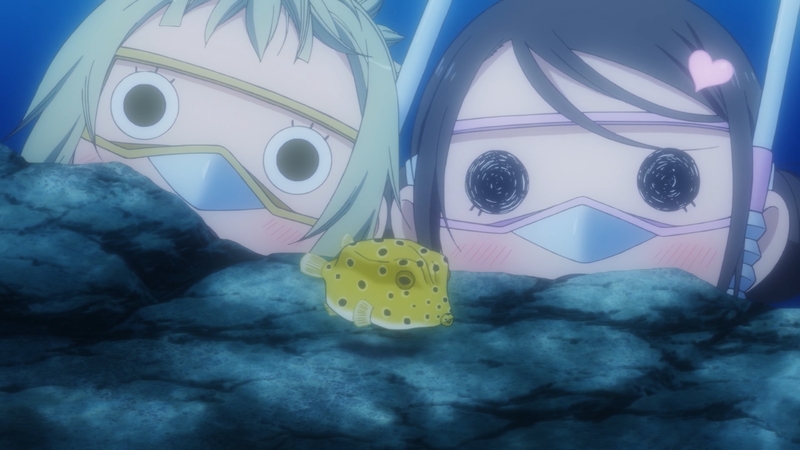 Even so…why am I focusing on Amanchu in a best-of-season post, if I only considered it to be above average? 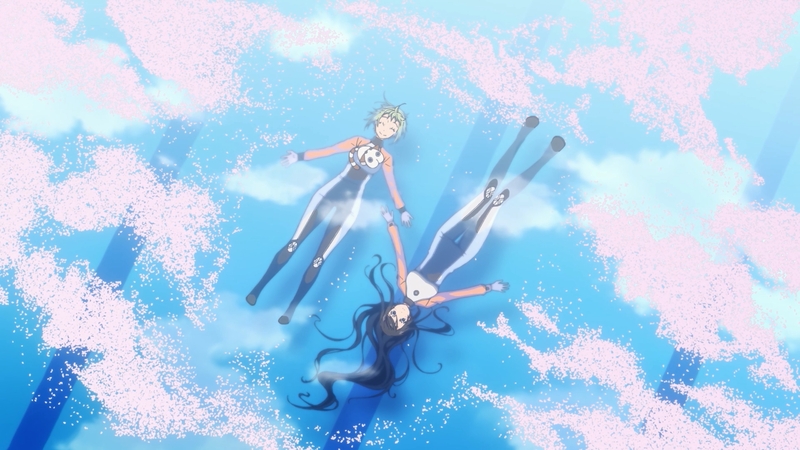 In many ways, Amanchu’s premiere and its final episodes showed numerous glimpses of great creative vision. Genre-defining, in fact. As a whole, the show’s pleasant, unassuming and enjoyable to watch (even more so if I was curled up in my bathrobe with a cup of lemon-scented green tea, enjoying the final weeks of Winter), its messages are straightforward and genuine, Pikari and Teko’s relational dynamic was at times out-of-this-world endearing. But, I feel the show can sometimes get a bit TOO comfortable with itself…dragging on moments of mundanity for the sake of selling a mundane atmosphere, and having characters outwardly spell out the show’s inspirational messages, despite having already expressed them competently with its overall cinematic presentation. Moments like this did work in Aria, but here…the script felt a touch too wooden and inorganic for its own good. Perhaps it’s the smaller scale and normality of the world that made me less tolerant of characters verbally expressing sentiment, but whatever. 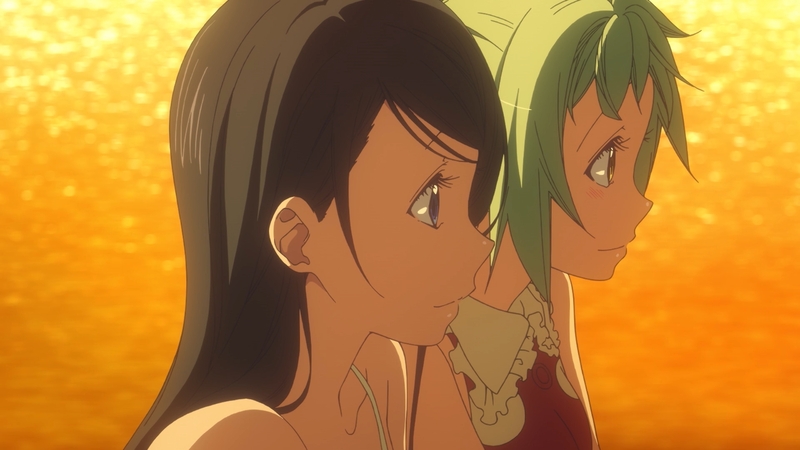 So, instead of talking ourselves hairless about the entire show, why don’t we focus on those precious nuggets of perfection that Amanchu has mustered throughout its run time? Because when it was at its best…it was borderline indescribable. Grand and absolutely mesmerising. I’ve talked in length about this already, in my three episode analysis of Amanchu. As the show finished airing, I am confident to say that while its soundtrack was relatively well done, it *mostly* failed to reach that next level with its melodic sensibilities. But there is this one track. ‘Aquamarine‘. Every purposeful narrative; no matter the medium, aims for that one definitive cathartic moment. Echoing every word I’ve ever written for the above analysis, episode two’s shared moment between Futaba and Hikari in the pool was carried magnificently by this one track. ‘Aquamarine’s sonic landscape was carefully constructed to describe otherworldly sensations of being underwater, while also maintaining multiple dedicate melodic textures with a gentle sense of lyrical flow. Not to mention marrying this music with one of the most enthralling scenes in the entire show…a perfect union of musical and visual majesty. But that’s not all, is it? 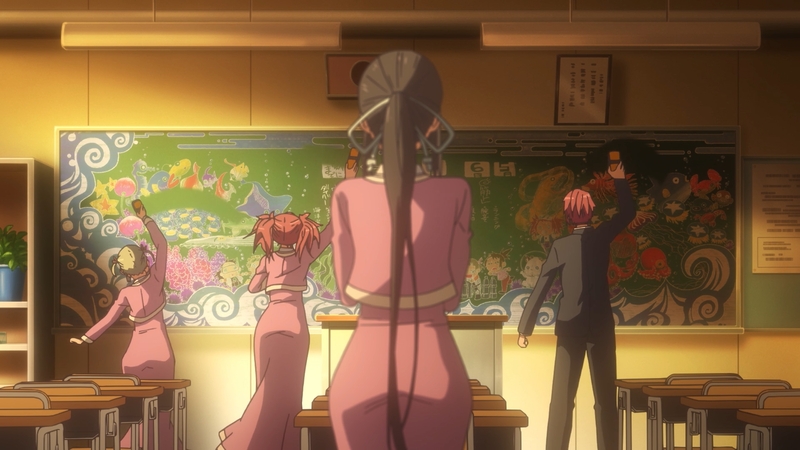 ‘Aquamarine’ goes on to accompany several other standout moments throughout Amanchu, including a rather understated, but meaningful encounter for the four main club members, who all shared the classroom blackboard as a collective art canvas in episode five. Buried by everything else, the scene ultimately acted as a barely-there commentary piece on modern sensibilities and interpretations of temporality. Sure, their masterpiece was photographed…but how much of the ‘original’ was truly saved? Did its temporality make it all the more meaningful? Nevertheless, the moment’s poetic beauty was unmistakable. 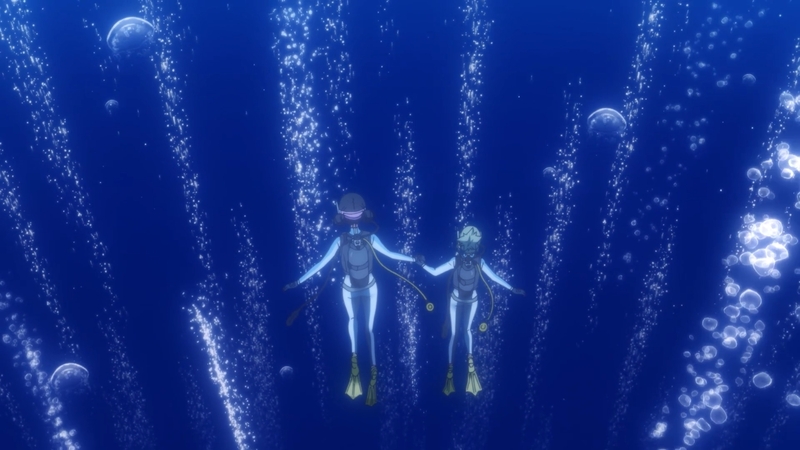 Refusing to let go of one final encore, ‘Aquamarine’ returned in full form for one more loving performance in Amanchu’s climax in episode 12. A whole new world opened up to Futaba, as she slowly descends towards the dark watery pit beneath her, with a single rope being her only support. After a brief moment of hesitation, the bubbles floating around convinced Futaba to soldier on. The reveal of the ocean floor was a spectacle for the senses, however brief it was. The choral textures of the music blends seamlessly with the rhythm of the visuals, creating a surreal environment that completely envelopes the viewer. 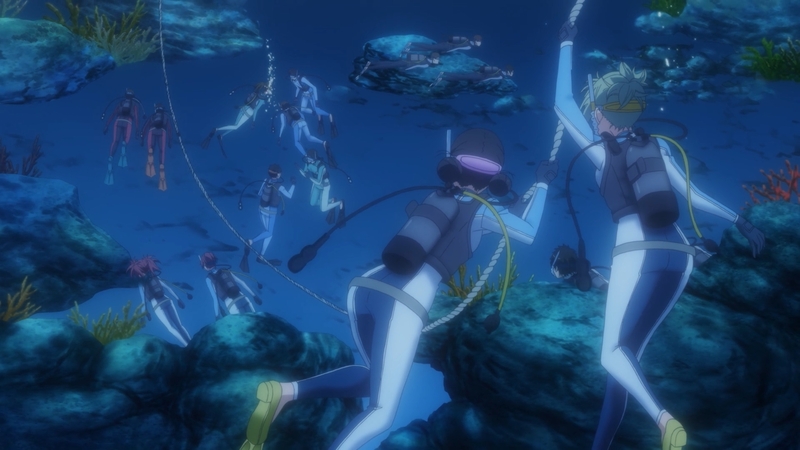 Tiny snippets of sea life, pods of divers doing their own thing, Futaba surrounded by her friends as she completes her final tests for the diving license. The moment felt meaningful. Hell, even the epilogue chat between Teko and Pikari was bathed in genuine emotion as the two confessed their devotion to each other as they were bathed in a golden sunset. I couldn’t ask for a better ending. Episode nine marked the definitive high point in Amanchu for me, as the emotional resonance hit peak form by the time it reached me. I was a wreck by the end. I think it hit me about 56 seconds into the episode. My mouth widened into a grin and my eyes lit up as they scouted Futaba’s two friends for a second longer, my ears perked up in skittish excitement. I’m hearing the voice of Akari and Aika from Aria the Animation. That distinctive ‘Hahi!’ from Akane, her ever-so-cheerful smile and those childish (not)pigtails…if there’s a better anime cameo than this out there, I would certainly like to know. Even though I only got to see them for a few minutes and hear them say a few lines, those sublime memories of me lazying around a couch in China, drinking in every last episode of Aria’s first season and falling in love with everything about it, came rushing right back to me. At that moment, I was Futaba. I felt like I myself longed to meet up with old friends again, desperately clinging to those old memories, hoping I could relive them again, refusing to let them escape me. 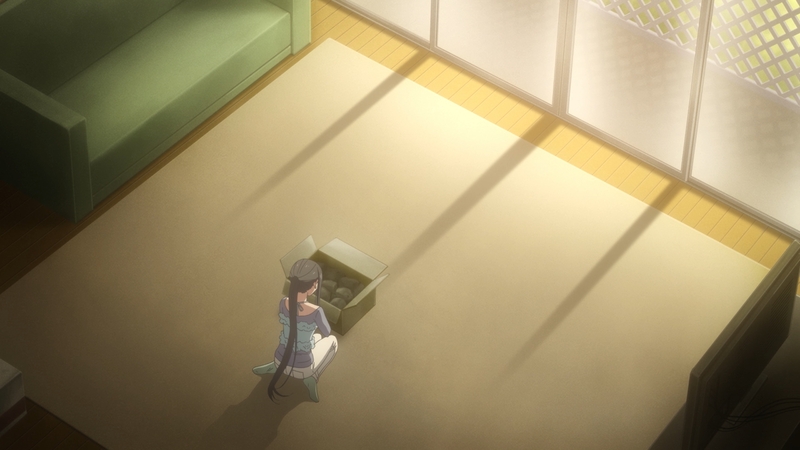 Not only that, around the episode’s midpoint, the episode took another melancholy turn, presenting Futaba’s initial loneliness after moving away from Tokyo in centre frame. It was nearly unbearable to watch. Hearing Akane’s voice on the other end of the phone only amplified the feeling of helplessness in Futaba, as she clung to the floor with her present phone charm, unable to say goodbye to her old friend, fearing that they will disappear from her life completely if she hung up the phone. The visuals did little to help relieve the loneliness, deciding to frame Futaba alone in the middle of an empty living room, surrounded by unsympathetic boxes of furniture bathed in the sunset light, while the shadows formed by the window frames subtly resembled the cells of a prison. 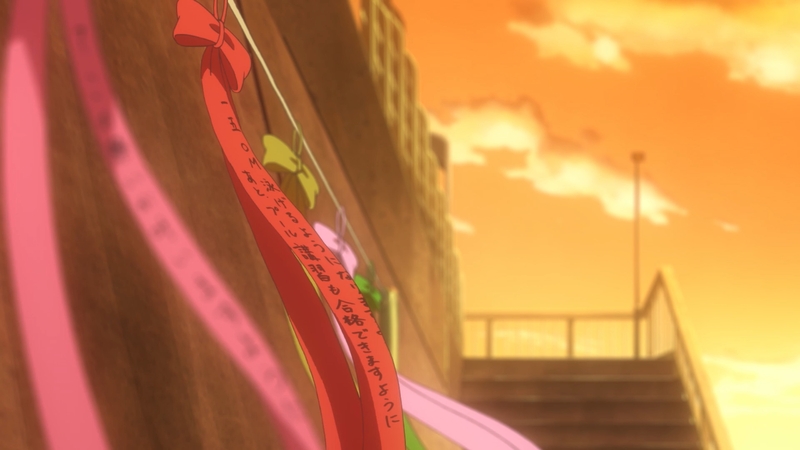 The second half of the episode included a cute little subplot for the diving club members, as they shopped around for a fitting present for Futaba’s birthday. Once again, Hikari unknowingly stumbled upon the perfect medicine for her friend’s moment of sadness. 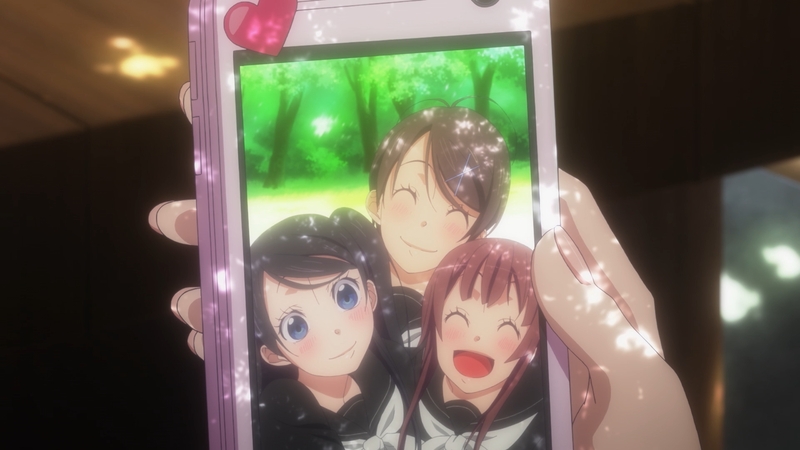 In additional to giving her a electronic photo frame for all those photographs that are taking up Futaba’s phone memory, she was given reason cherish the new relationships she has so fortunately stumbled upon with Hikari, along with the old ones that she didn’t really need to dwell upon. Perhaps it is obvious to her in the end, that Hikari was the present that she didn’t realise she truly wanted, and needed. And where does it all end? We see Futaba alone again, her new phone strap proudly donned on her phone, chatting with Akane with renewed energy. It was a perfect character arc for Futaba. And boy was it a perfect nostalgia trip for me too. In the end of everything this show had to offer, I sat back on my chair, drinking everything in. 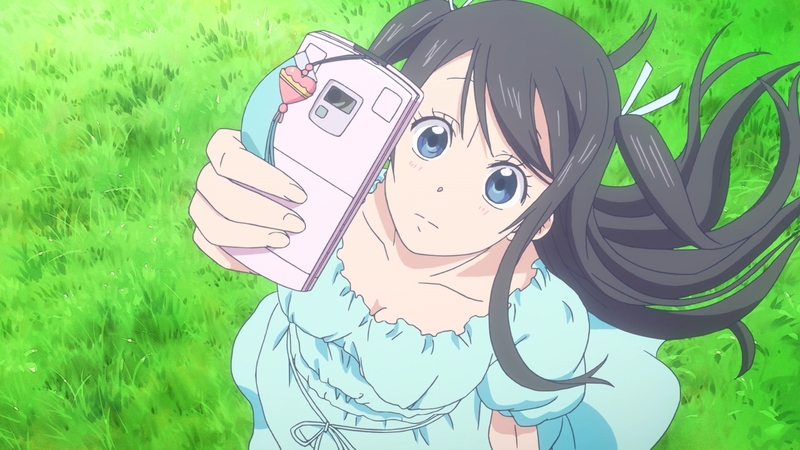 Amanchu felt like something precious and alive. When I say this, I say it with the most amount of sincerity I can muster: when this show shines, it is truly amazing. End notes: I kinda went back to my roots here, talking about a Slice of Life title I liked with a storytelling edge. I hope readers appreciate it as much as I enjoyed writing this way. Slice of Life is by far my favourite mega-genre, and I certainly hope it shows here. If I can react like this to a show I wouldn’t consider to be a complete masterpiece, imagine when I do find a show in the genre that can fit that mold. Until next time.